At the beginning of autumn 1956: the Ross Sanatorium in Gaspé had a farm and several cows to provide milk to the patients. It was raw milk. 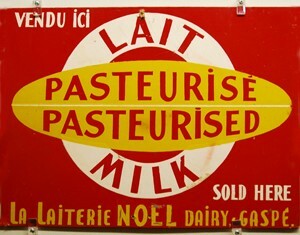 At that time, the government started to oblige pasteurized milk. 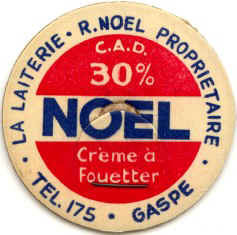 Roland Noel had thus the idea to organize himself to pasteurize milk. He asked Armand Joncas, contractor, to build a factory on Mgr Ross street in Gaspé (today the building is situated at 92, Mgr Ross street). 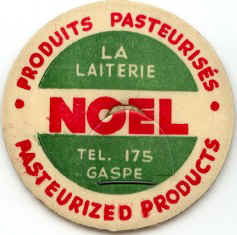 To start the business, he bought milk from the Ross Sanatorium, pasteurized it and resold it at this same institution. The request increased and the provisioning was difficult. Then he had to go to buy milk at Grande-Rivière on the southern side of Gaspésie, and at Sainte-Anne-des-Monts on the northern side. There was much loss and milk was expensive. In addition, Roland had to buy trucks for the transportation of milk, employ more personnel etc... At the beginning, the washing of bottles was done by hand. The trucks were not equiped to refrigerate milk during transportation which caused much loss. For publicity, we had small measuring rulers and we also made chocolate milk. The company lasted until 1962.